Princess Sparkle Pony's Photo Blog: Reflected Glory? So fun-luvin', so stylish, so classy, and aging so gracefully! We just love her. And look! Condi was there, too! "Andrew Lloyd Webber and conductor Zubin Mehta"
I'm just real dang sure Mehta felt right at home in THAT sentence. As always, I revel in the 'classless' society we call Amurika! Kind of like Condi and Dolly together. But I really LIKE Dolly, I'm just afraid her face is going to slide off into her cleavage and tremble like a Blanc Mange (white mange, like scabies or someth'in). They put Andrew Lloyd Webber next to Condi because he, too, is used to spinning heartbreak and tragedy into Pure Gold!!! Ha ha, Jess, great observation! 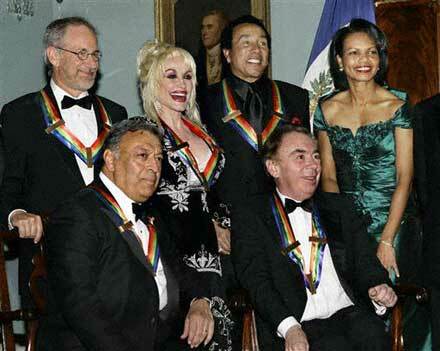 WHAT is up with the fricking Kennedy Center Honors? Have we totally run out of truly astonishing old people? Has it come to the point that where once we had Martha Graham, Agnes de Mille, Leonard Bernstein, Lillian Gish, Aaron Copland (on and on), now we're reduced to... Stephen Spielberg? Don't even let me commence with that, um, shall we say -- BRITISH -- Lloyd Webber nonsense. Don't get me wrong -- Smokey is G*d, and Dolly transcends even that, and Zubin M. is the real deal, classics-wise -- but they're not exactly in their dotage and ready to shuffle off this mortal whatever. Why don't they just give next year's ribbon to Mrs. Federline and call the whole shebang off? But on to the really important question: is that dress in fact made from the last remnant of the parlor drapes at Tara? And do you supose she actually thought to herself, "hmm, all this shuttle diplo-matching-armchair-photo travel recently has made my collarbones especially gaunt -- why not a portrait neckline to emphasize that?" I also note: No pearls (suprising), no up-do (good thing, on the whole), and, potentially, odd pose -- it's like she has her knees pressed together in the position one assumes when starting a particularly vivacious Charleston (a dance that not one of these honorees would remember, more's the pity). I, too, was surprised she didn't sport the updo with that dress. Very thoughtful, thorough analysis, Muscati! UGH, what is that horror of a dress she's wearing? It's not St. Patrick's gay cousin's coming out party. She just looks like Lea DeLaria in white chiffon. Have you all ever been in a store in the DC area when Condi wants to shop? Good Lord, the Secret Service descends, common folk are cleared out (whole store if it's a small place, just a department if it's a big place), so that Condi can peruse the merchandise. Sometimes she comes in at closing, which is a blessing. Then again, I'm not doing a lot of shopping at Harriet Kassman. It's sort of like Eurotrash meets aging preppy. What's the point of all this? I think that sometimes Condi doesn't have much time in the stores, what with spinning the Bush disasters and waiting for the Secret Service to clear the stores. Poor dear ends up grabbing any old thing off the rack. Condi's just doing her best Marilyn pose. Picture a billowing white dress (in lieu of the shamrock-frock she's sporting) in an updraft. And if you survive that image, laugh yourself silly. I love how Dolly's medal is being sucked into the black hole of her cleavage. Poor dear had a breast reduction years ago, but STILL, her chest can warp gravity on a localized scale. LOVE HER! Wish I'd said "ShamFrock." Oh well. I'm a firm believet in the Power of Eclecticism and mixing up high and low culture, but the Kennedy Awards honorees have to be the weirdest melange of people every year imaginable, and this year's edition really takes the cake. Condi in that scary green dress is simply the icing on a very odd cake. "Condi in that scary green dress is simply the icing on a very odd cake." As a faithful PP reader, may I say, "thanks Mike for an astute comment." If I were a girl and had breasts, I wouldn't wear a "Look! Cleavage!" neckline to any event with Dolly Parton. There's just no need to compete with the master. Why is Condi hunching over in the photo? Is she trying to do that high fashion curve thing that most of the teen anorexics, uh, top models seem to be doing these days? I've noticed the flat-chestedness of Condi before, but speaking as another flat as a board girl, putting her in a photo with Dolly is just cruel, though serves her right for advocating torture. Insto-karma! I think Princess F. is trying not to tower over Smokey R., kind of like an awkward 14 year old w/ her shorter prom date. Curtains from Tara gets my vote, Yuk!